I need a vacation. Maybe it is the end-of-winter blues or maybe I just long for the anticipation and excitement of traveling. New surroundings bring new experiences, new opportunities, and new discoveries. Some of my travels were good times and some not so good. I had unique adventures and ones that changed my life. How has traveling impacted your life? Joanna Marple has lived, worked, and visited over 50 nations. One of her adventures led her to work at a bilingual international school library where she said, "I became re-enamoured with children's literature and the impact I saw these books having on my young students." This experience helped transform her love of oral storytelling into storytelling in the written form as an author of picture books. (Beth Stilborn's blog - By Word of Beth). Her first book, Snow Games illustrated by Maja Sereda, debuted on the uTales ebook platform which allows families to purchase a subscription (only $4.99/month) that gives access to the entire uTales eBook library or pay only for books they want (Snow Games is only $2.99). The uTales library is currently available online or as an app for iPad/iPhone/iPodTouch, however the uTales website states that Android is coming soon. Are you curious how a world traveler would celebrate her birthday? I contacted Joanna to ask if she would be willing to share a birthday memory. And guess what? She shared three! I celebrated my 26th birthday on a small fishing boat dipping its way back from the island of Tabon to mainland Chile. The thing I was most grateful for that day, as the winds blew and the sea tossed our small vessel every which way, was that I reached land with my insides intact! And the small medical team with which I was working, they hung up balloons and made me a special meal of rice and fish! Yay! I celebrated my 30th on the beach by lake Malawi, where the team had made me chicken sandwiches - chicken was normally a once-a-week only treat! My 40th was much more extravagant. Twenty friends and I spent the weekend in a wooden refuge up in the mountains above Nice, in a hamlet called Sauze. 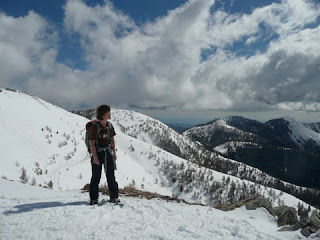 We enjoyed great French mountain cuisine, danced the salsa and spent the next day snowshoeing. The idea for Snow Games, came to Joanna while in Mercantour, one of France's nine national parks. "We had trudged through a beautiful pine forest on the way to the lake and I had spotted two very different sets of tracks in such a pattern that I was convinced it was two animals having fun together in the snow as I was doing with my friends." (clarbojahn). The published version of Snow Games evolved from the first draft written that night at the national park to feature four animals -- Bear, Mouse, Squirrel, and Owl. 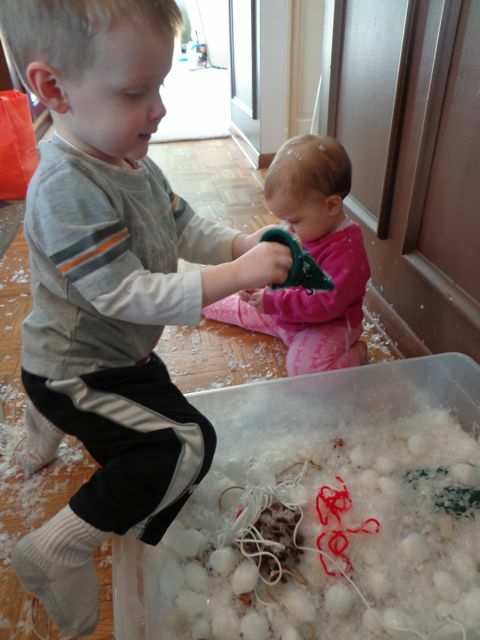 The friends enjoy sledding, snowballs fights, and building creatures out of snow. As we read the story together as a family, Owl was our favorite character. We couldn't help admiring her pinecone skiing and snowball juggling skills. In my research I found out that Owl has a story. "Prior to writing Snow Games, I had been involved in a collaboration project of 30 uTalers, who together produced The Friendship Alphabet book. Maja Sereda had done an enchanting double page spread for "ogling owls" for the "O" page and seemed the perfect fit for my story -- happily for me, she agreed. (See the Ogling Owls - click here)" (Susanna Leonard Hill). Our admiration for Owl became the inspiration for our birthday celebration activity. 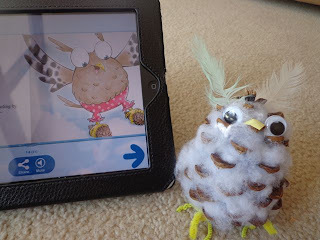 I remembered seeing a very cool owl craft on Pinterest that I thought would be fun and easy for my children to make. To complete this craft we used a pinecone (we had cinnamon scented ones! ), cotton balls or batting (I preferred batting, but both will work), 2 googily eyes, something to make a beak (we used yellow paper), yellow pipe cleaners for talons, craft feathers, and glue. 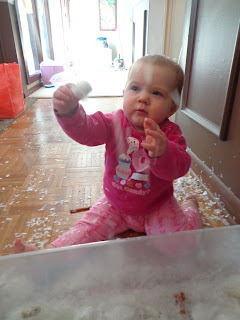 The first step was to pull apart the cotton balls or batting. 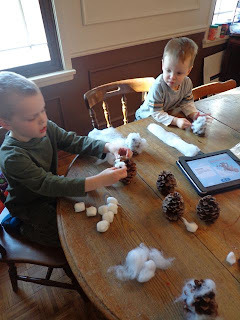 Then, those pieces were stuffed into the pinecone. 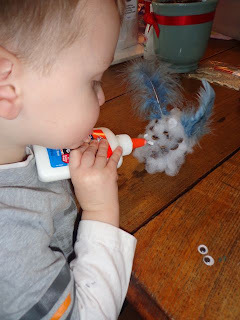 Next, we glued on the details -- tuft feathers, eyes, a beak, and talons. Looking good, but we couldn't figure out how to get pink pants on our owls! The boys loved making the owls! (Actually, my youngest son made two more owls the next day!) But, the birthday celebration wasn't over yet! I scored a whole bunch of winter clearance items from a local craft store (Thanks Tami!). It ended up being everything we needed to make a SNOW GAMES sensory bin! First, we added the fake decorative snow! 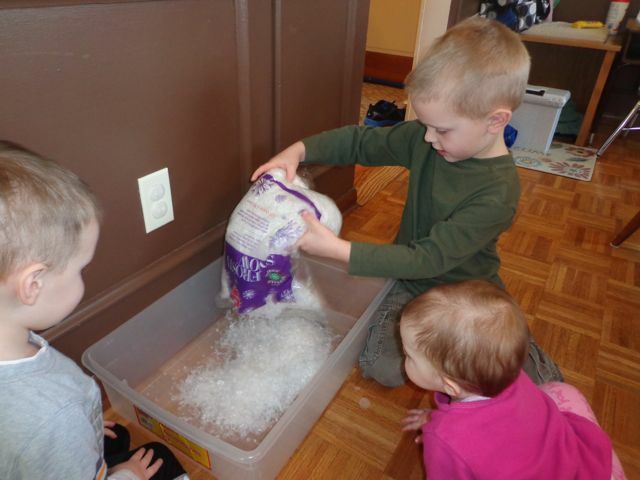 Then, we added items to the sensory bin that made connections to the story. Red yarn = The shoelaces of Mouse's red leather shoe sled! Oh my was this exciting! We were so happy the littlest one awoke from her nap to join in the fun! 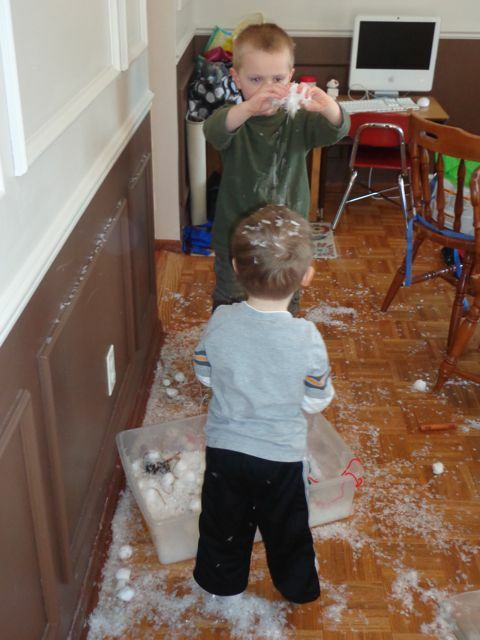 It was snowing in our dining room! It must of been cold because the mittens went on too! 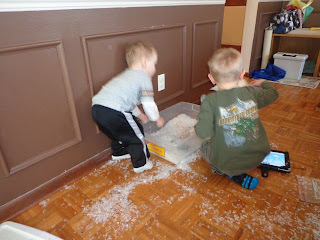 We had snow everywhere! We had to sweep three times to get everything cleaned up! 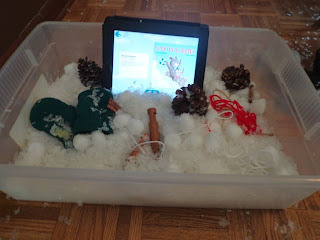 I think my son just Blue's Clues Skiddoed (skidoo on Blue's Clues means jumping into a book) into SNOW GAMES! Whew! What a fun day! Happy Birthday Joanna Marple! Thank you so much for being a supporter of Happy Birthday Author! I really appreciate you taking the time to share your birthday memories! We hope you have a fabulous day! 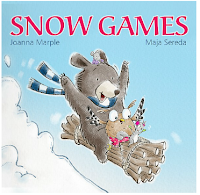 Exciting News: Joanna told me that she is working on several manuscripts right now and has just sent off the SNOW GAMES sequel to her illustrator Maja Sereda. "In Midsummer Mischief, Bear, Owl, Squirrel and Mouse sneak off for some summer fun, only to stumble upon a forbidden, hidden location and a friend in need." Boy, how cool of a dad are you-'snow' in the house! The pine cone owls are ADORABLE, and I'll certainly be pinning the project. Happy Birthday Joanna Marple! Thanks Donna! Some would call me cool and others would call me foolish! The kids had fun and that is all the matters! Thanks for pinning! I can't think of a more awesome birthday present than being featured on this blog. Thank you, Eric and kids! 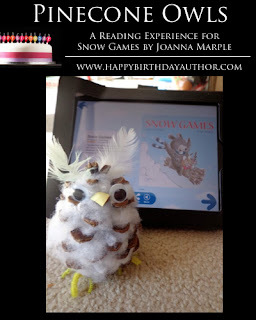 Your OWL has brought SNOW GAMES alive in such a new way to me. Your blog posts are always so beautifully crafted. I love this blog. Joanna! This was so much fun! Thank you for sharing your birthday memories with us. My son and I looked up all the locations today. He thought it was really cool. Fabulous story! Fabulous Blog! Such a wonderful idea. Thanks and Happy Birthday Joanna Marple! What a wonderful post! Happy birthday to Joanna -- I'm so happy to be able to call her 'friend'! Great birthday memories. Wow! Love that owl craft, and the kids look to have had so much fun. Long may the Snow Games continue! Thank you Beth! I appreciate you sharing the post today too! How amazing is this whole post! I have been in love with that owl since I saw the ogling owls (plus I love anything owl anyway), so this post is right up my owly! Joanna, that is exciting news about the sequels. Creating characters that you can reuse and put in different situations is my dream, and you've got such cute ones to work with. Once you've completed the ms, about how long does each one take to be illustrated and published? Thank you once again, Eric! This manuscript had soooooo many months of revisions. And I am indebted to Lori Degman, who has been working diligently on me with the meter! Maja is a professional freelance illustrator, committed to several projects, so I think we could be looking at quite a bit of time before this one is released. Renée. Thanks Renee! The owls have been flying around our house and landing in different places! It has been lots of fun. Can't wait for the next book Joanna! Wow, what great birthday memories you shared, Joanna! I'm sure the snowyshoe weekend in Sauze must have inspired your wonderful story, 'Snow Games', just a little, too. I love the amazing owls by your very talented little owlets, Eric. I'll bet those owls would look great perched in my old tree. Wishing you all more fun days, and a happiest of birthdays, Joanna! Thanks Jo! The owls were so easy! They may have inspired the theme for my youngest daughter's first birthday party too! Nice tribute. Love the pinecone owls. Happy Bday Joanna! 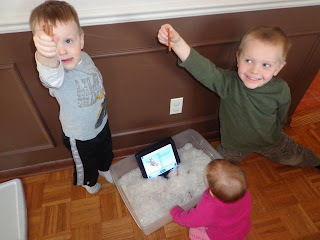 Wow - fantastic activity and wonderful pictures as always, Eric! And happy, happy birthday, Joanna! Thanks Susanna! 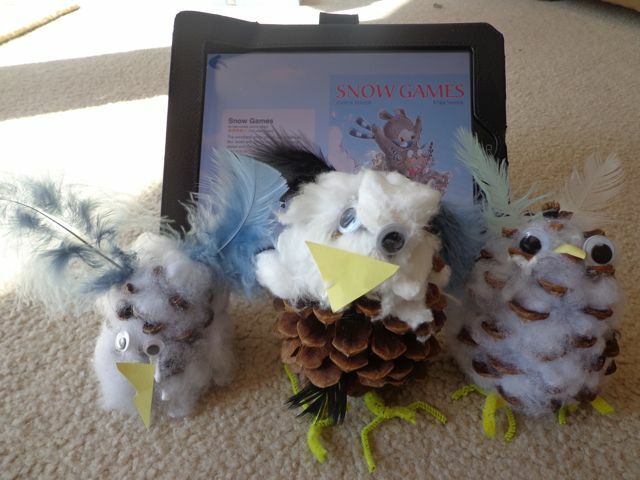 I love the picture of the pinecone owl and the owl from SNOW GAMES. She looks like she wants to tell us something! Hi, Eric and Joanna. Snow Games looks adorable! Eric, you and your family are amazing. And how great you are to let your kids make messes. 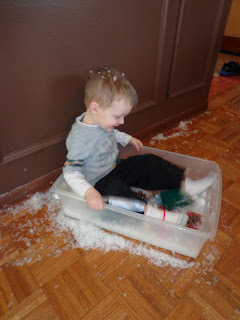 I'm all for letting kids have a good time, but I hate the cleaning part. The fact that you swept three times is incredible! Joanna, it was so fun to learn more about you, your book projects, and your amazing travels. Happy birthday! Love the post, Erik and Joanna! I might try that craft with suet and a few seeds - I see a tree full of wee owls! Thank you all for your kind birthday wishes and comments. Happy (belated) birthday Joanna. Love the craft Eric! Happy waaaayyyy belated birthday, Joanna! I was sorting through my stacked up Inbox and look what I missed. This is a wonderful post! And what cute owls you make, Eric!